Today was leftover day...I had the last piece of my Greek Style Spinach-Feta Pie for lunch. For dinner, I had the last piece of salmon and the rest of the sauteed brussels sprouts and red cabbage from last night. But, the most exciting part of my evening...was that my shipment of extracts that came today from OliveNation (I know, how dorky, right?). I've been using their extracts since last year -- they have one of the largest varieties of pure natural extracts that I have found. I never purchase any imitation flavored extracts. I couldn't eat my dinner fast enough so I could whip out my plain Greek yogurt and begin sampling the new flavors! The 4 new flavors that came today are: Black Currant, Banana, Peach and Hazelnut. I tried all the fruit flavors in yogurt this evening and every single one was awesome -- the fragrance of the black currant was so heavenly, I could wear it as perfume! LOL Those 4 new flavors added to my growing OliveNation collection of: Maple, Coconut, Pineapple, Chocolate, Bourbon Madagascar Vanilla as well as their vanilla bean pods. I bought these flavors so I could add the natural flavors of what are typically higher fructose fruits to my plain Greek yogurt to jazz it up a bit sometimes. I also think they would be good in whipped cream or cream cheese to make little fruit flavored cheesecakes, tarts, etc. without adding fructose. I snapped a couple photos below so you could see my growing OliveNation collection of extracts. You can purchase them directly from OliveNation or find them at my Amazon aStore. This doesn't even take into account the other McCormick and Frontier natural flavors I have as well. If you are looking for a large variety of unusual extracts (most are pure and natural), check them out. Enjoy! P.S. -- Notice how sunny it was in these pictures about an hour ago -- it is now pitch black outside and there are tornado warnings here and one has already been spotted west of here -- yikes!!! 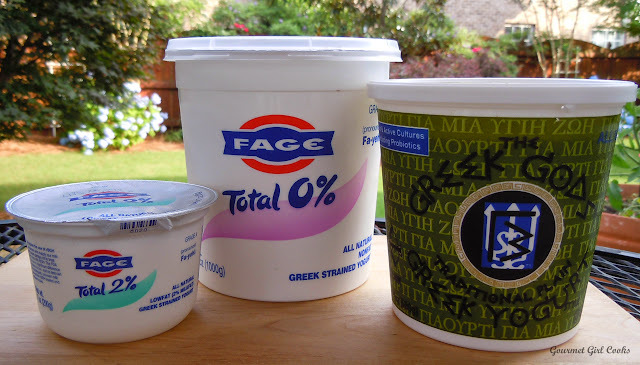 Here are the different varieties of yogurt I will be adding them to -- non-fat, 2% & full fat! This is what is going on here tonight!!! 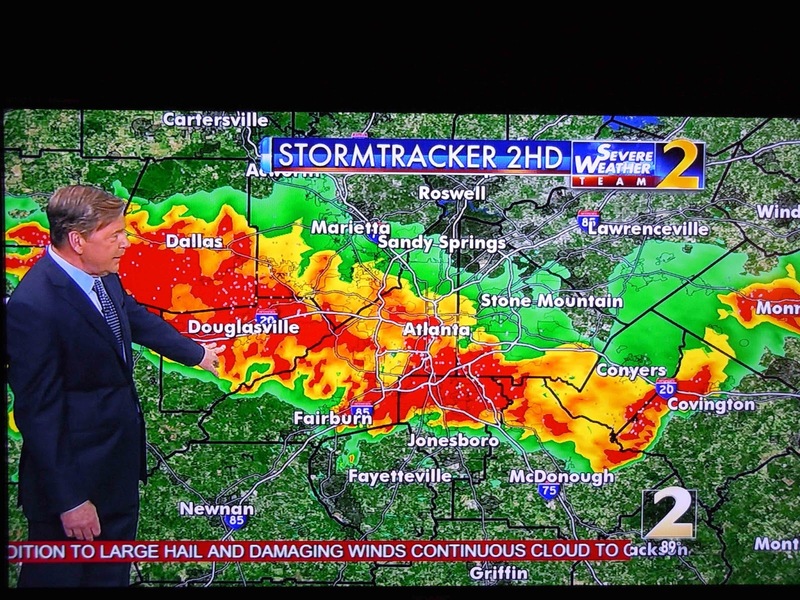 I hope all is well with your weather ... very scary. The weather this year certainly has been weird for a big part of the country, hasn't it. 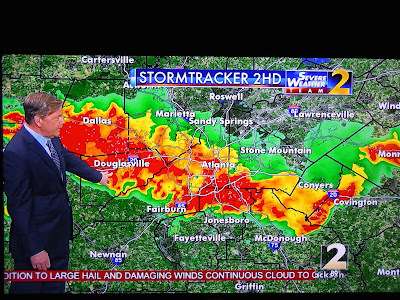 Do you unplug your computer during storms? A few years ago our computers were damaged due to lightening striking the power lines, so now at the first sign of threatening weather I turn my computer off and *unplug* it. Hope that by this time it's passed by you without incident. Keeping my fingers crossed for you. Hi cyber Sis, she likes it, she really really likes it! LOL. Well I gues we are off the hook !with the black currant flavoring. Hi GG, I am glad that the storm past. I am absolutely horrified of thunder storms. As a child we lived for a short while in Schleswig Holstein (Germany) with out any elevation in sight, no hills , no mountains , my father was miserable Well the thunderstorms were the worst that one can imagine. The sparks would come through one lamp and then continue to all the other lamps! We lived in a village and the haystacks would catch fire and I remember my father trying to put out the fire with an ax and throwing dirt. To this day I am scared to death. Be well and SAFE ! Barbara. The bottles look so beautiful! I noticed that you bought the 8 ounce size of the Maple flavor. What do you use it for besides pancakes? Would like to hear your favorites after more experimenting. Peach sounds wonderful and reviewers rated cherry highly......but you don't have that one in your picture! Anyone tried that? Hi GG and CyberSis, remember Black currant flavorings? LOL. Until recently (historically speaking) the innocent black currant was an outlaw fruit in North America, Yes banned from these shores. It seems these little berries(which also come in red and are much prettier than the black) had a PR problem- people thought they were detrimental to native white pine trees, and so they were banned. No longer thank Goodness! I just found this piece in the Trader Jo Flyer. Quelle surprise! GG, you asked about Germany. Bavaria is in the south-East and that is the only place I would live if I moved back to Germany, you would have loved it there, it is so different from the rest of Germany, very happy people, maybe because they dring the best beer that one can find any where! I spent my honey moon there (Munich) and suffered horrible blisters on my feet from walking in high heels and very pointed shoes on ancient *cobble stones*. I kept the pumps because they are hand made and absolutely beautiful! I had a thing for shoes , bought too many(pointed, high heeled pumps) and now I am punished because my feet are ruined and I have to wear very ugly shoes. but as long as I can walk I am happy! Schleswig Holstein is in the northern part of Germany! I will never go back there! What interesting facts about black currants! I learn something new every single day! Those Beer steins are worth a fortune now! You have a very lucky friend! Barbara -- while talking about German collectibles (beer steins) -- I have a hummel collection. Did you ever collect them? My mother's collection is much bigger -- I bought many of them for her. I know they used to be very valuable, but don't know if they still are in this economy. GG, no I never had a Hummel collection because I was influenced by my parents who thought that they were Kitsch, not art! I think Hummel is more loved in the USA. But GG I think just as beauty is in the eyes of the beholder so is Art. The main thing is that the pieces bring joy to you! Chacun a son gout as the French say! Did you know that the Hummel pieces were created by a German nun? the best years of my life! Hi Gg, I wrote a comment this morning, but it was not posted, just as well! You asked me if I liked Monet, of course I do, Monet, Manet, Degas etc. You like flowers in paintings, I do too but I prefer paintings of French landscapes, especially by George Seurat, some remind me of Switzerland, which is my favorite country . Unfortunately many countries are losing their Identity , I would like to explain further but it would be politically incorrect! Don't you love it! I am also having a lot of fun with these flavorings, sometimes I forget what concoctions I created, I have to write them down!. Tonight I put chocolate drops in the Almond milk with some stevia. Tomorrow I have to try to put pecans in my yogurt with the peach drops which are from another company. I always forget the nuts! I have white peaches they will be ripe the end of June. They are beautiful but have not much flavor, I prefer yellow ones. I baked your peanut cookies , that was so easy and fast. I had no chocolate left , so I used 1 tsp. of cocoa powder. They are delicious especially with coffee or old almond milk. Have a good Sunday with nice weather ! Barbara. I'm considering buying some Olive Nation flavorings/etracts, and have a couple of questions--probably stupid ones but I'll ask anyway. I am following a program not quite grain-free but restricted grains and otherwise I think about the same. Definitely wheat-free and sugar-free are terribly important, as are eating pesticide-free produce and organic when possible and local too, with meat products as healthy as possible too--grass-fed, etc. When I looked at the extracts at Olive Nation, I found it a bit confusing. There are some that are organic and have two forms--a regular and an organic. In the case of the red raspberry, there's a clear form too. Some of the extracts are labelled as sugar-free, others are not but it appears no sugar is added, but I'm wondering about fruit sugar which would be just as bad for me. Are all of these extracts sugar-free? I am particularly interested in at the moment maple, lemon, red raspberry, mango, perhaps caramel or butterscotch. It was confusing as well with cinnamon--there's a cinnamon extract and then a cinnamon oil--the oil is much more expensive. I'm more concerned about the health issues but of course want the great taste. I'd be interested over time in adding to these, I especially love fruit-flavored full-fat yogurts and would love to find an alternate way to enjoy these. Thanks so much for your help, I appreciate it!!! Have you considered making a really good sticky cinnamon bun? One that is more bread-like than with a biscuit base. I understand it would be healthier with lots of nuts, but I'd almost prefer to eat the nuts as a snack and have the cinnamon bun without. Last question, I really dislike the taste of coconut, probably the taste I dislike most. I'm managing to cook with a coconut oil that has its aroma removed, and don't mind coconut milk--but the smell of coconut flour is awful for me. It's used in so many recipes--what would be the next best thing to substitute. When flaked coconut is in a recipe I usually just leave it out. Sorry for all of the questions, I'm just keen to do what I can for my health. Thanks again, you are such an encouragement and a great role model for so many of us, and I am looking forward to baking with a baker friend who is coming to visit this weekend, we hope to try a number of your bread-like recipes--buttermilk biscuits will be my first, can't wait!!! Yum!!! With gratitude to you for how you've helping me stay on this new way of eating and living!!! First, thanks for the kind words. I hope you enjoy your baking weekend with your friend, too! About the Olive Nation flavors and extracts. I noticed that some say no sugar and some don't, but then don't list sugar as an ingredient. Maybe it might be a good idea to call them before ordering. I enjoy the flavors I've bought from them and the funny thing is that I initially ordered them to flavor yogurt, too! I missed the different fruit flavors as well. I have not used cinnamon oil before. I believe it is more intense than extract. While I like all the Olive Nation flavorings I've bought, I have found a maple extract that I like even better (since you mentioned maple). It's made by Boyajian and seems to be stronger flavored. As far as coconut flavor. I'm not super crazy about coconut flavor in everything either. I've gotten used to the regular coconut oil. I'm assuming you are using the refined which is supposed to be tasteless or very close to tasteless.